Lord Ayyappa is not mentioned in Puranas but Sasta, a synonym of Ayyappa, is in a Vedic hymn, as the killer of Jalandhara. There is mention about Bhoothanatha/Sastha in Brahmapurana and the name of Sasta occurs in Mahabharata also. 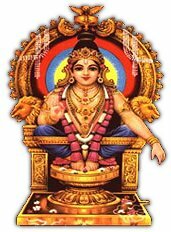 The name of Ayyappa or Harihara Suta, the son of Hari and Hara, is nowhere found as a deity admitted in the Purnaic pantheon. Researches done in the history of south Indian rituals and religions unveil the fact that Ayyan and Amman are the two most venerated deities of the ancient Dravidians. Ayyan means literally a noble man, the term being a corruption of the Sanskrit word Aryan. In Prakrit languages it becomes ajja, atta or ayya. In Malayalam the term for father 'achan' obviously come from ajja, the corrupt word of Arya. Therefore the term 'Ayyan' is now used as a word of respect to denote father, revered person or brahmin. Adding the honorific formative 'ar' to Ayyan, it becomes 'ayyanar, who is believed to be the guardian deity of the villages of Tamilnadu. Even today you see temples of Ayyanar throughout Tamilnadu with huge statues of the deity installed on horseback. As village-guardian this deity is held in high esteem by the people. He is bestowed with many powers. People going on a hunting trip to the forests offer prayers to him for their safe return. For normal child delivery of the women in villages they make offerings to Ayyanar. Journey by boats in rivers is to be solemnised by Ayyanar only. He is also the god of the mercantile community. Thus there is no walk of life among the villagers, which do not require the blessings of Ayyanar. Amman, the mother-goddess of the Dravidians also looms large in the life of the villagers. The concept of God, the almighty in the form of Mother and Father is as ancient as could be. In the most developed form of Hinduism we have the concept of Purusa, the man and Prakriti, the woman which has their roots in the ancient Dravidan deities of Ayyan and Amman. Lord Siva is supposed to be a Dravidian deity, later admitted into the Hindu pantheon as one of Trinity. In fact Siva is Ayyan, the father god, and stories woven around Siva show that He had to take on different forms on different occasions for different purposes. When he took the form of an elephant, a son was born to him and He is the Elephant deity, Ganapati. On another occasion he became a hunter, Kirata, and the worship of hunter god is still continued in south India, especially in Kerala, where he is rightly named as Vettekkaran, literally the hunter God. Vettakkorumakan, the son of hunter god, is but a different concept of the same deity. In many Ayyappa temples, this form of the deity is worshipped. The deity is bestowed with a bow and arrow,and he is seated either on horse back or an elephant. Thus the vehicle (Vahana) of the deity is found changed from horse to elephant, both being symbols of hunting. In short, it won't be improper if Lord Siva and Ayyan are identified. Later the two gods were separated and given individual status, when Lord Siva retained his position as father and Ayyanar or Ayyan as son. Father and son in Christian Trinity are same; and in this context it is no wonder that Kirata Murti or Hunter God is sometimes identified with Siva and at other times as Ayyanar, the son of Siva. When Saivism developed as an independent and powerful faith under the banner of Hinduism, Ayyanar got a completely independent status in the pantheon as the son of Siva. Thus he is rightly known as Harasuta, of Sivaputra, literally the son of Lord Shiva.